The transition in working life presents a challenge for competence in professional decision-making and requires deeper cooperation between professions with different knowledge bases. Digital services will transform the nature of customer interaction by proliferating opportunities and models for interaction in situations previously relying on face-to-face communication only. Increased freedom of choice for citizens and equality in access to services require professionals to have the capacity to recognise the needs of vulnerable population groups and to champion their rights. Training must provide professionals with the means for critical thinking, for solving complex and unanticipated problems and for making decisions in changing operating environments. What are the challenges in professional decision-making that employees are facing, and how do they resolve them? How do online discussions in blended learning, simulation teaching and co-development workshops enhance the competence of students and professionals? The purpose of the subproject is to develop innovative pedagogical models and methods for improving professional problem-solving and decision-making competence from the perspective of lifelong learning. The pedagogical models developed in the subproject will be directly applicable to the needs of degree-based training in health and social services, to continuing education and training exports, to curriculum planning and as support for political decision-making. This subproject is an action research study for planning and implementing teaching and development interventions. Data are collected from health and social services students and professionals through questionnaires, interviews and workshops. 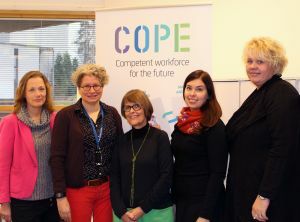 From the left: Soile Juujärvi, Piia Silvennoinen, Elina Rajalahti, Aino Maijala and Outi Ahonen.